St. Martin's Griffin, 9780312610807, 608pp. 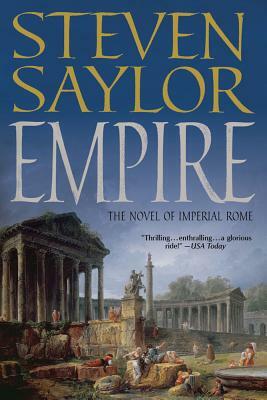 Continuing the saga begun in his New York Times bestselling novel Roma, Steven Saylor charts the destinies of the aristocratic Pinarius family, from the reign of Augustus to height of Rome's empire. The Pinarii, generation after generation, are witness to greatest empire in the ancient world and of the emperors that ruled it—from the machinations of Tiberius and the madness of Caligula, to the decadence of Nero and the golden age of Trajan and Hadrian and more. Empire is filled with the dramatic, defining moments of the age, including the Great Fire, the persecution of the Christians, and the astounding opening games of the Colosseum. But at the novel's heart are the choices and temptations faced by each generation of the Pinarii. Steven Saylor once again brings the ancient world to vivid life in a novel that tells the story of a city and a people that has endured in the world's imagination like no other.